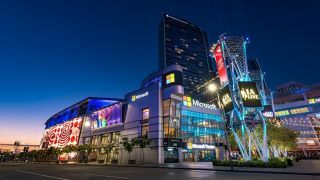 Update: We're just a day away from Microsoft's big E3 2018 showcase! Not sure what to expect from the makers of Xbox One? Here's everything we know about Microsoft's plans, plus all the other things we'd like to see on Sunday. With the launch of Xbox One X, Microsoft went pretty big for E3 2017. And that puts the pressure on for E3 2018 because now we’re hoping this Xbox showcase will be just as big as the last. Now, we’re not expecting any kind of Xbox Two reveal or anything but this is a chance for Microsoft to really set the tone for the next few years until the next-gen console arrives. With the Xbox One X being the most powerful console on the market right now, we’re hoping Microsoft will pull out all the stops when it comes to software at this year's Xbox show. Xbox appears to be doing well at the moment, but E3 is the perfect platform to address criticisms that the console doesn’t have enough first-party exclusives and concerns about the mass move towards online service games. We’d love to see some big exciting announcements that really show off what the 4K console can do. These announcements will hopefully include some Xbox exclusives that have been developed with all that power in mind. Microsoft is often criticised for its lack of exclusive games and we think E3 might be time to announce one, if only to appease the fans who look at Sony’s offering with somewhat distraught eyes. We imagine there are going to be plenty of exciting third-party reveals at this year’s show but one striking first-party announcement outside of the long-running exclusive franchises has the potential to steal the show. It would be understandable if Microsoft was unwilling to announce a brand new first-party IP very early in the development process after what happened with Scalebound but some kind of tease would probably be well received. At the very least we can probably expect some exciting ID@Xbox reveals. Titles like Cuphead and Ori and the Blind Forest have done well for Microsoft in the past so it’d be surprising if there weren’t a few more announcements in this vein. Although we’d love to see some kind of Gears of War 5 announcement this year, we’re not holding out too much hope. Gears of War 4 was released in 2016 which is, in the game world, a while ago. However, Gears of War 3 was released in 2011 so large gaps between releases is not unusual for the Gears of War franchise. Earlier this year there was an apparent pre-E3 leak from Walmart Canada which may have revealed some unannounced games. Gears of War 5 was one of the games. Another of the titles from the leak – Rage 2 – ended up being real but some others – Forza Horizon 5 – were far less believable for obvious reasons. Whether this leak was accurate or not, it has given us some hope, however faint. If Microsoft were to make a Gears of War 5 announcement with a prospective 2019 release date, it would still be a very respectable three year gap between releases. We’re not really expecting Halo 6 to appear at this year’s Xbox presentation in any big way this year but we do think it’s more likely to show its face than Gears of War 5. The Halo games do, after all, tend to follow a three year development cycle and Halo 5 was released in 2015. In light of that, we’d love to see the next Halo acknowledged in some way. Following the announcement of a Halo arcade game, 343 Industries' Brian Jarrard was quick to promise fans on Twitter that work on the next console game was not impacted. In a roundabout way, this is a confirmation that Halo 6 is in the works . So, since it's pretty much common knowledge that 343 Industries has been hard at work on another Halo game, we'd love Microsoft to acknowledge this in some way at the show. Whether it's a teasing logo or a full-blown trailer we'd be satisfied. Now, we think it’s likely that Microsoft will make a Forza Horizon 4 announcement this year and we’d be very surprised if it didn’t come from the usual developer, Playground Games. However, Playground did open a second studio at the end of 2017 which suggests it’s working on a little more than usual and we’re really hoping we’ll find out what that is at this year’s show. There have been a lot of rumors around the possible return of the Fable franchise recently. With the closure of Lionhead and the abandonment of Fable Legends, it all ended somewhat tragically and abruptly for one of Xbox’s most beloved franchises. Although Lionhead is no longer operating, it’s been suggested that Playground Games is working on Fable 4. Now, we don’t know if there’s any truth to these rumors but Phil Spencer has previously said the series still has places to go. The reports around Fable 4 have suggested that the game will be an open world RPG with a focus on narrative and story; this is the kind of title Microsoft is lacking at the moment in its exclusive offerings (particularly compared to PlayStation) so if there is any truth to these rumors, we’d love to see Microsoft make some kind of announcement at this year’s show for a 2019/2020 release. We know so little about Age of Empires 4 it’s starting to get painful. The game was first announced in August of last year with no release date and an announcement trailer seemingly comprised entirely of concept art. When you start a hype train journey like that, it’s probably best to have a station not too far down the line. You’ll understand and probably share our desire, then, to find out a little more about the game at this year’s E3. A rough release window if we’re feeling our most optimistic, a little gameplay footage or a confirmation of some of the nations that will make an appearance if we’re being more realistic. Anything would be welcome. When Microsoft announced Project Scorpio during E3 2016, it made a point of saying that the console would support virtual reality. Yet 2018 has arrived, Project Scorpio has become Xbox One X, and we still haven’t seen any sign of a dedicated VR headset and Microsoft has gone rather quiet on the matter. Although Microsoft has launched some Windows Mixed Reality headsets in partnership with big names like Asus, Lenovo, Dell and HP, we haven’t heard anything about them working with Xbox One X, despite the fact that Microsoft has been trying to blur the line between its platforms. We’re not sure if Microsoft has simply decided it’s no longer interested in competing with Sony in this area or if it’s holding off on announcing a dedicated console headset. But if Microsoft is going to tag the Xbox One X to come into the VR ring, we reckon it’ll have to do so during E3 2018.